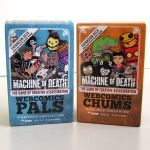 This listing is for both the core game and the Machine of Death: The Game of Creative Assassination – Webcomics Pals/Chums expansion. Both the game and the expansion have been opened but never played. Some of the decks in the core game are still in shrink. Everything is complete and in excellent condition. S&H is FREE within the UK.